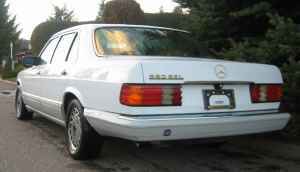 1990 MERCEDES BENZ 560SEL, White, Tan Leather Interior. Brought car to Spokane from southern California. Body solid, no rust. This is your chance to own THE "big power", luxury, highly rated, full size Benz sedan. $2195 cash STEALS IT! Hurry, CALL David at 509-928-XXXX. While I need one of these like I need a hole in the head, (and one of which I might get once Jill finds out about it) I thought it might be fun to mess with. Jill's been wanting the SDL back in action but it needs a lot of fiddly stuff which I largely don't have time to do right now, not to mention the car's been wrecked enough times that I'm losing some interest in keeping that particular one up. The ad's pictures looked good so I was wondering if maybe it might be more ready to go than the SDL, and gas prices are down right now so a gasser isn't as stupid as it might have been a year ago. As before, I gave it a week to go away on me, but it didn't. Fate again? So I went to see it. It did look pretty good. 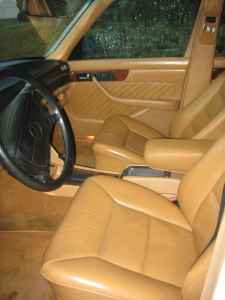 What's more, it was the fully-loaded version complete with heated seats and a reclining rear seat. Plus it had the 560's standard self-leveling suspension, which is nice to have on a road trip or whenever Jill's hauling another carload of tiles, and dual air bags. (The downside of the second airbag is the loss of the glove box, and the use of the front seat for small children.) Visible problems were a bit of butchery on the interior, but nothing too bad. It needs a replacement passenger seat belt, the rear center brake light housing repaired or replaced, some floor mats to cover the base carpeting, and a rear speaker grille. The antenna was also gone. On the plus side the sunroof worked, as did the windows I tried. As did the seat heater. It started and ran fine. There were signs of leaking oil, and I think the SLS pump is leaking. The tires are in usable (but not great) shape. It has a little over 209,000 miles on it. PO didn't think the AC was really working, but that the heater was. Never tried the cruise. Anyway, I'd originally bought it for my wife to drive, but she took a dislike to it, for various reasons, and so I've ended up driving it. I like the interior spaciousness, and it's an excellent place to take a nap when necessary.